After a very nice breakfast at Castle View in Kirkby Stephen we started day 2. Overall this was day 7 of our version of Wainwright’s Coast to Coast walk as we started last year. It was an easy walk out of the village, with a stop for photos of Wild Boar Fell. Then 2 hours later we were on 9 Standards Rigg. I forgot to take a photo on my mobile so Al sent me one of his (the one with a line of big cairns). The 9 Standards Rigg are a set of large cairn-like structures. I now have a set of photos of them. The way down to Whitsundale was literally a quagmire of peat bog. I hate peat bogs and avoid them in the Peak District except when dry or frozen so this was a bit of a trial. Al offered to to treat me to a hot chocolate at Ravenseat Farm. 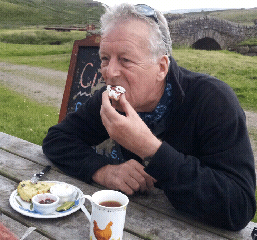 He had seen it on the Yorkshire Dales tv programme (the farm not the hot chocolate!). Unfortunately, he only had £20 notes so asked me to pay. I’m still trying to work out how me paying for my drink as well as Al’s drink and scone constitutes a treat! Al did his good deed for the day by freeing a young lamb from the fence. It was trapped by it’s horns. We came down to the road and went back to Wain Wath falls. See photo. These are very photogenic falls and I ran off a few rolls. The lower falls were best. I had to wait to take photos of the upper falls because 2 women kept swimming across my picture under the falls. How thoughtless! Staying at Keld Lodge tonight. Black Sheep Ale is very good. The Black Sheep Blonde was good when we arrived. Tomorrow we walk to Reeth. Don't believe all the stories you hear. 9 Standards Rigg is boggy but not impassable. The views compensate for the bog. We followed the August to November route. For a hardened bog trotter like me it wasn't a problem! Aha Dave! Good new update! This section of the walk I was most worried about the soaked ground! Maybe I should ask my question again! 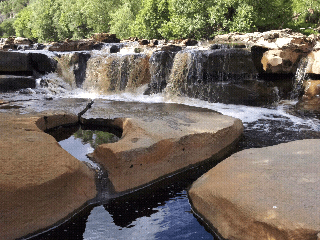 How wet was it under foot and would you advise one of the alternate routes to keld?